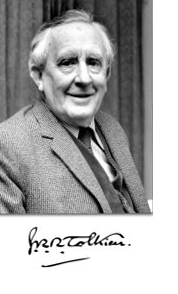 John Ronald Reuel Tolkien (1892–1973), writer and philologist, probably did more to change the face of English-language fantasy than anyone other single writer. Almost all his fiction was set in his imaginary Middle-earth: The Hobbit; Or, There and Back Again, published in 1937, and the three volumes of The Lord of the Rings, published in 1954 and 1955, were what he regarded as complete. The Silmarillion was published posthumously in 1977, and thereafter much else was published by his son Christopher Tolkien, including Unfinished Tales of Númenór and Middle-Earth (1980), and the twelve volumes of annotated material published as The History of Middle-Earth. I have written about this in Edward James and Farah Mendlesohn, ed, The Cambridge Companion to Fantasy Literature (Cambridge: Cambridge University Press, 2012), so will write no more here. See also the entries on Tolkien in the Encyclopedia of Science Fiction and the Encyclopedia of Fantasy. Tolkien’s father left England in 1889, and became manager of the Bloemfontein branch of the Bank of Africa. JRRT was born in Bloemfontein in 1892, and his brother Hilary in 1894. His mother Mabel returned to England in 1895, expecting her husband to join them, but he died in Bloemfontein in February 1896. Initially they settled in the countryside outside Birmingham, near Sarehole, but when JRRT got a scholarship to King Edward’s School in Birmingham, they moved into town. She converted to Catholicism in 1900; she died herself (of diabetes) in 1904. She left her sons as wards of Father Francis Morgan of the Birmingham Oratory, who arranged for the boys’ welfare. When Tolkien fell in love with Edith Bratt, a fellow lodger, Father Morgan separated them and made JRRT promise not to communicate with her until he came of age. JRRT was successful at school, and learned the languages which lay behind his later academic career, and his fiction (Old English, Old Norse, Gothic, and some Welsh and Finnish). He was very close to a small number of fellow pupils, who formed a kind of unofficial literary club. He went up to Exeter College, Oxford, in 1911 to read classics. He did not do very well, and transferred to English. He got a first in Finals in 1915. Just after midnight on his 21st birthday he wrote to Edith Bratt, and they became engaged. After his war service, he returned to Oxford, and worked for a time on the staff of the New English Dictionary (working mostly on W words, like walrus and walnut and wan, because they were mostly derived from Germanic, which was his speciality). In 1920 he became Reader in English Language at the University of Leeds. Late in that year his second son was born, and Christopher and Priscilla followed in 1924 and 1929. He became professor at Leeds in 1925 (at a very young age for such a senior appointment—but, then, so many potential rivals had died in the War). But in that same year he was elected to the Rawlinson and Bosworth chair of Anglo-Saxon at Oxford, and he moved to Oxford and stayed there for the rest of his career. As an academic, he did not publish much, although what he did publish, such as an edition of the Middle English poem Sir Gawain and the Green Knight and an edition of the Old English poem Pearl, was very important. His most significant achievement was his 1936 British Academy lecture, “Beowulf: the monsters and the critics”, which is still read by all those who want to understand that great Old English poem. While thinking about Beowulf, he was thinking about The Hobbit, and the links between the two texts can be clearly seen. Tolkien’s fiction arose out of his meditation upon language and upon medieval literature. In this he had the considerable support of a group of like-minded scholars, who called themselves the Inklings; chief among these was fellow-medievalist C.S. Lewis. During the Second World War Tolkien continued teaching, and working (slowly) on The Lord of the Rings. In 1945 he moved to the Merton Chair of English Language and Literature at Oxford, holding it until he retired in 1959. He and his wife left Oxford for a while (partly to get away from the increasing hordes of his fans). Edith died in 1971, and soon after he returned to Oxford, to live in Merton College itself. He was appointed CBE in 1972, and died in September 1973. It is difficult to know what Tolkien would have said if he had known, via time machine, that in 2009 Forbes.com would report that he was the fifth highest earner among dead celebrities (or “delebs”): behind Yves Saint-Laurent, Rodgers & Hammerstein, Michael Jackson and Elvis Presley. I have relied heavily on the entry in the Oxford Dictionary of National Biography by T.A. Shippey. Shippey has also written two of the most important books on Tolkien: The Road to Middle Earth (London: George Allen and Unwin, 1982) and J.R.R. Tolkien: Author of the Century (London: HarperCollins, 2000). The standard biography is Humphrey Carpenter, J.R.R. Tolkien: A Biography (London: George Allen and Unwin, 1977) (and Carpenter has also written a study of the Inklings). “As an academic, he did not publish much, although what he did publish, such as an edition of the Middle English poem Sir Gawain and the Green Knight and an edition of the Old English poem Pearl, were very important.” Should this be ‘was’ very important? Thank you for this great resource, it’s incredibly useful! Was? Yes, I suppose so. Correction will be made! And thanks for your comments.